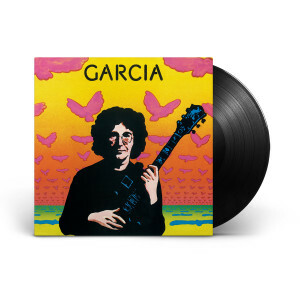 An exclusive re-issue of Garcia (Compliments), Jerry's second full length solo studio album. Garcia (Compliments) has been pressed on 180gram black vinyl by Quality Record Pressings in Salina, Kansas. The Garcia (Compliments) vinyl was remastered for vinyl release by Joe Gastwirt with lacquers cut by Kevin Gray. Originally released in 1974, the album was simply titled Garcia. To distinguish this release from the eponymous debut, Garcia (Compliments) takes its revised name from a "Compliments of" sticker which appeared on promotional copies of the album. The album was produced by long-time collaborator John Kahn and peaked at #49 on the Billboard charts upon initial release. Kahn selected the compositions featured on the release with the exception of "Russian Lullaby," which was selected by Garcia. When asked about the selections, Garcia noted: "John and I share such similarities of taste, something that I like John is almost sure to like it. We're very like each other musically. That's one of the reasons I've been playing with him all this time." In addition to a track list that boasts classics from artists like Chuck Berry, Smokey Robinson, and Peter Rowan, Garcia (Compliments) also boasts an all-star cast of the 1970's most in-demand session players. Joining Garcia & Kahn are drummer Ron Tutt (Elvis), guitarist Larry Carlton (Steely Dan, Joni Mitchell, Fourplay), organist Merl Saunders, and legendary backing vocalists Merry Clayton, and Clydie King, among others. I have an older copy that is well in need of an increase in sound quality. Very much worth the purchase price. Super high-quality reproduction of the original album. 180g vinyl, high-quality paper-stock for the sleeve, vivid graphic art, poly-vinyl inner sleeve. The whole package reeks of quality. Listening to the record is a joy to the ears. I never owned this album on vinyl so I find myself enjoying it again anew. The sound-quality vs. the CD is evident. I really enjoy it and I'm happy I picked up a copy.